Concept art of Tyrant for the Vermin Swarm of Avras in Vetia. 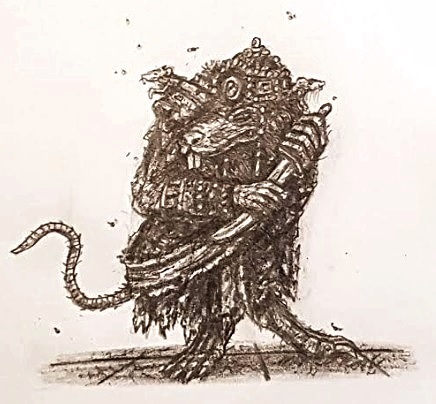 These Ratmen overthrew the strongest Human empire to ever emerge in temperate Vetia during ancient times, and then proceeded to lord over a shrinking realm where they tried to maintain the captive high culture and material achievements (such as architecture and engineering) of ancient Avras through a bitter cycle of ruination, repair, setbacks and decay. Through ages of struggle this mighty people lost their dominion bit by bit as they had to battle against foes beyond counting on more fronts simultaneously than could be managed. As such their history beat to a pulse of slow, drawn-out yet inexorable decline, where dips into dark ages may be followed be resurgent might and reconquest, and even brief golden ages of blossoming population, wealth and culture, only to see corruption, decadence, disease, treachery and fell fortune topple their restored ascendancy and cast the Vermin Swarm anew into a maelstrom of struggles against overwhelming odds. Diplomatic sowing of divisions abroad, choice assassinations of enemy leaders, and baffling grand strategy (centered upon their capital of Avras) all allowed the Ratmen to carry their beset empire through ages of chaos and destruction. For it was cunning, more so than raw strength, which saw them win through to survive for yet more ages of war and disasters. The overarching story of Avras in the Ninth Age is a parody of a parody. For it taps into the commonplace way in which the long history of the Roman realm, ever since the Enlightenment and Gibbons in particular, is unthinkingly wrought into a parody of the past, with half of Roman history (the mediaeval half) being artificially separated from its own antiquity by the label of Byzantine - a name which still has a good ring to it. These Byzantines then have their scandalous parts and failings highlighted, while skipping over the fact that this declining realm managed to hold on for an astounding number of centuries in the face of way too many enemies beating down upon it from too many fronts at once. The reality of the mediaeval Roman Empire is a fascinating and bitter story of a realm and culture that had long since passed its peak, yet still refused to lie down and die where greater powers of its era went under the bus. The parody version casts the Byzantine Empire as little more than a tiresome parade of monks, eunuchs, craven defeats, stupendous titles, and incessant palace murders and civil wars: And so what can be more fitting than to take hold of the parody, and run it to the hilt in fantasy fiction through Byzantine Ratmen? After all, both Warhammer Fantasy's Skaven (the most original of Games Workshop's major WHFB armies, and one not based upon any historical culture) and the historical Romans/Byzantines do have mediaeval flamethrowers and treachery in common. Enter, the Vermin Swarm of the Ninth Age.